Today I took a boat along the Chao Praya River to a market in Nontaburi province. I passed Wat Arun (วัดอรุณ) or the Temple of Dawn, and I couldn’t help myself take a photo of this beautiful temple as if I was a tourist seeing it for the first time. Wat Arun is one of Bangkok’s best know landmark. It stands on the west bank of the Chao Praya River in Thon Buri. Wat Arun is best seen from the opposite bank of the river; it glistens in the sunlight during the day and stands dark and noble at dawn or dusk. A visit to the beautiful, peaceful monastery complex surrounding the familiar towers is very worth-while. These towers, the “Phra Prang,” (พระปรางค์) although best known, the only part of Wat Arun. It also contains narrow lanes; elegant, old white buildings; shrines, pools of turtles; and two fine giants, ” Yuk Wat Jaeng,” (ยักษ์วัดแจ้ง) mortal enemies of the ” Yuk Wat Po” (ยักษ์วัดโพธิ์) across the river. I look like an ant comparing to these two giants. I searched more information about Wat Arun and I came up with the following. Construction of the tall prang and four smaller ones was started by King Rama II 1809-1824 and completed by King Rama III (1824-1851). The towers are supported by rows of demos and monkeys. Very steep and narrow steps lead to a balcony high on the central tower. The circumference of the base of the structure is 234 meters, and the central prang is 250 foot high. The central balcony commands an impressive view of Bangkok across the river. From here one can see the Grand palace, the Temple of the Emerald Buddha and the spacious Wat Po. The towers of Wat Arun are built of brick covered with stucco. The decorations are unique; thousands of pieces of multicolored Chinese porcelain. In niches in the central tower are green figures of the God Indra seated on Erawan, the traditional Thai three-headed elephant. Niches in the smaller towers contain figures of the Moon God, on a white horse. The trident of Shiva extends from the top of each tower. The decorations are unique; thousands of pieces of multicolored Chinese porcelain. I visited Wat Arun once, I experienced something that I did not get when visiting other temples which was it was very challenging to climb up the “Phra Prang” tower and even more when going down. I was scared to death when I was walking down from the top. My hands were sweating like there was no tomorrow, and I was so tense so my thigh muscles got tense up as well, that caused my legs hurt for a week. I did not know that I am scared of height. Hahaha! It costs 20 Baht (0.67 USD) to enter the prang compound. Also be prepared for the obligatory exit through an alley lined with souvenir stalls. I have to say that Wat arun is my favourite Thai temple in Bangkok. In 2010, when I last made a trip to Bangkok, I have tried myself climbing up the “Phra Prang” tower, but unfortunately, it was so crowded that I could make it. I can fully imagine how you felt scared during your ascent/descent from the high top! Maybe next time when I have a chance to visit Thailand, I will look forward to trying it out myself! 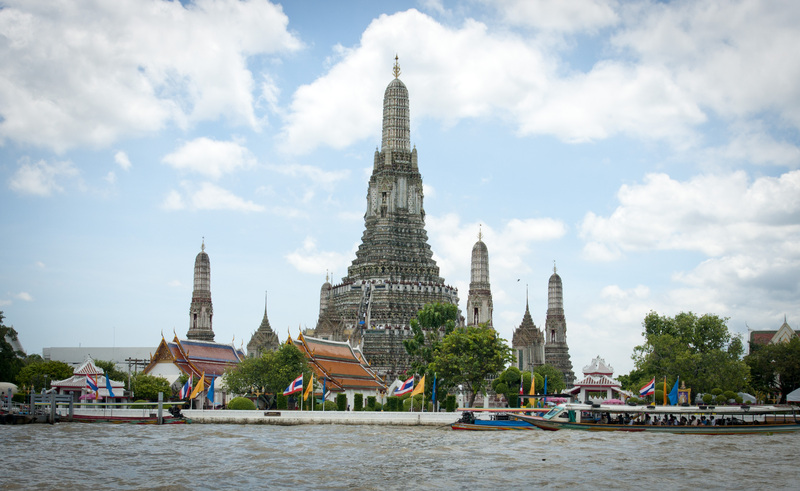 don’t forget next time why it’s named Wat Arun………..Named after Aruna, the Indian God of Dawn.